Vintage British Indian Old Postcard. India. General View, Qutub Minar. Kutab Minar, Delhi. Built by Rai Pithora and completed by Qutab Uddin and Altamarsh in 1220. Height 238 feet. 379 stairs. / Commenced by Kutbuddin-Ibak in 1200 and completed by his successor Shamsuddin Altamash in 1220 A.D. It contains 379 stairs, & is 238 feet 1 inch in height. 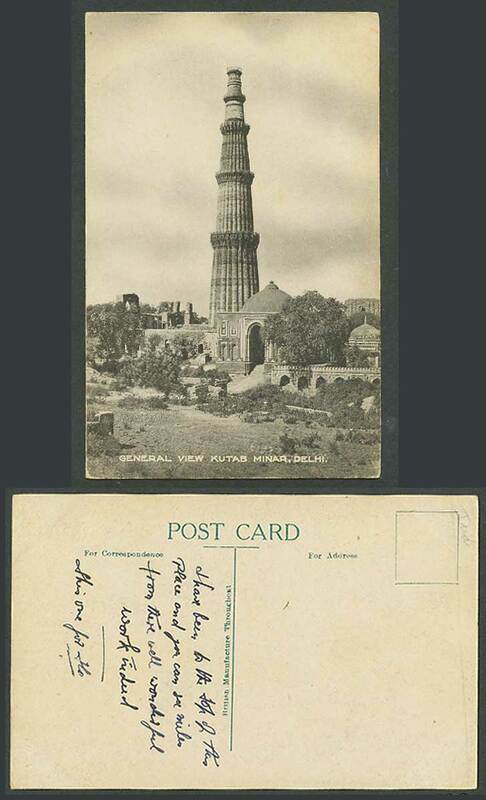 / Qutub Minar and the Historical Iron Pillar. This famous Minar was commenced by Rai Pithora and completed by Qutubuddin and Altamash in 1220. Height 238, Diameter 47 ft. and 379 Stairs.